With the aesthetic of an upscale, fine dining establishment, Chef Lin creates a nationally recognized, award-winning vegetarian + vegan menu influenced by the places that she has visited domestically + abroad. Stop in for a multi-course meal or try the “chicken” + waffles during Sunday brunch because this staple of the Atlanta vegan scene can do both wonderfully! 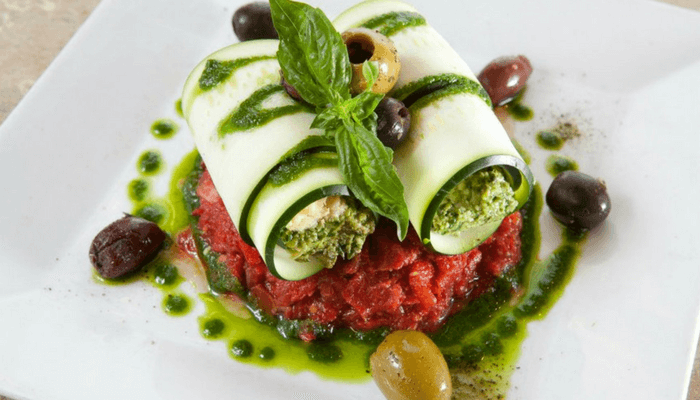 Athens’ preeminent vegetarian restaurant since 1987, enjoy delicious homemade vegetarian food, just a few blocks from downtown! A 100% meat-free eatery in a historic building who serves innovative dishes in a diner-style setting with generous portions + low prices. A “go-to” for many locals who love the quick service vegetarian restaurant where you choose the dishes + the server plates it for you. Stop in to try a spicy tempeh wrap or another local favorite, Booch tea, aka, blueberry Kombucha. Great for gluten free diets as well! Deserving of one of the more passionate recommendations we were given during our search for the best vegetarian + vegan restaurants across the country, this place has been labeled “by far the best vegan food in New Orleans”. Perhaps because the menu changes often depending on the season + availability of locally sourced ingredients, keeping locals interested and coming back for more. Or, is the cozy, living room atmosphere you are seated in while you wait? Either way, this hole-in-the-wall restaurant is a can’t miss in NOLA! Seed ($$) - Vegan spins on comfort-food classics (e.g. po' boys) in a contemporary space! The effervescent space evokes a springtime sentiment with a lavender, white + grey color palette alongside live indoor plants throughout the dining room. A restaurant + coffee shop, they work hard to bring in other local brands in addition to their beautifully plated plant based dishes. They just opened last November, but are so good that it was recommended by two different people for our list! A hip cafe serving vegan + vegetarian fare, plus coffee drinks, in bright, breezy environment, labeled as “approachable” by some of the more skeptic locals. Come for a quick + yummy breakfast or lunch and stay for the Southern inspired, SoCal vibe. This fast casual restaurant has come to D.C. to bring the Israeli inspired food trend to our nation’s capital. Almost every element of the vegan, Middle Eastern-inspired menu is a play on what you'd find in a meat one. The small space is laid out with specific attention to maintain the aesthetic of makeshift marketplace, complete with a pantry featuring products for sale curated by the owner, Ran Nussbächer. NuVegan ($) - Vegan restaurant in the Park View area that offers vegan soft serve, raw food, soul food like mac n cheese, biscuits, + fried chicken! 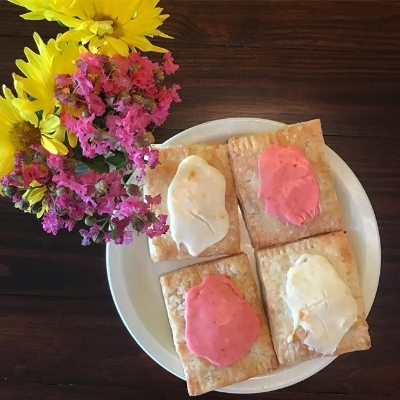 What started out as a vegan pastry supply company for local coffee shops has evolved into its own storefront dishing out vegan breakfast. 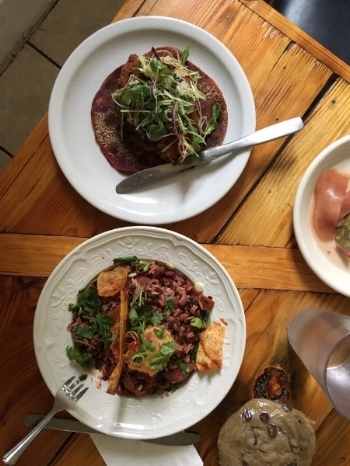 This brunch spot is known for wonderful vegan donuts, pop tarts, and breakfast sandwiches! A hidden gem for anyone who enjoys vegan cuisine. What started off as a personal way to eat cookies + cakes while maintaining a vegan lifestyle, chef Sue Zhao has grown the menu to a full lunch cafe. The interior is a minimalist, clean decor with creatively-named dishes that taste pure + fresh! No qualifier is needed for this high end establishment. The food is delicious, gorgeous, innovative + “out of this world” according to one of our contributors! If possible, sit outside to enjoy the ambiance of their beautiful garden space. Enjoy beautifully plated dishes + astonishing service that will make this a truly one-of-a-kind experience! Any of your favorites not make our list? Let us know in the comments!